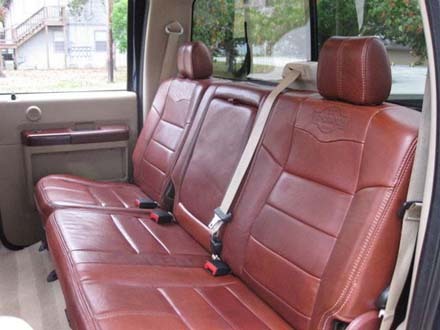 SEAT PICTURES: Click on "Images"
DESCRIPTION: A water-borne penetrating dye for coloring aniline & semi-aniline King Ranch leather. After the third cleaning and the water still beads up with no dark circle, lightly sand the leather with #600 sandpaper. This will help to break the surface coating and allow penetration (always sand when using color #SAC-707). Clean again with #TC - triclean prep cleaner and a soft cloth or paper towel. 1) Check color match. Mix 3% crosslinker (#SL-7) into the aniline dye color (helps to set the dye, **ALWAYS ADD**). 5) To slightly increase the gloss, apply a top coat clear of #AN - aniline clear mixed with 2% crosslinker (#SL-7). 1) Check color match. Mix 2% crosslinker (#SL-7) into the semi-aniline dye color. 5) To slightly increase the gloss, apply a top coat clear of #SAC - semi- aniline clear mixed with 2% crosslinker (#SL-7).